Life science is one such intriguing subject that the teacher teaching life sciences is often excited to show the children some experiments which would be captivating, exciting, stimulating, absorbing and interesting. Most experiments suggested in text books faithfully follow the syllabus, and are designed to be done in a laboratory. As we are aware that several schools due to some reason or other do not either have, nor have access to a science laboratory, majority of the experiments in this book have been carved in a way that they can be done anywhere anytime. Having fun meddling with commonly available resources such as waste materials, water bottles, etc and also reading and learning from several sources, I always desired to come out with simple experiments for children. I then started using such experiments in workshops I conduct for teachers where it became an instant hit. Dr D K Pande of the NCSTC, DST, New Delhi being present in such workshops opined that the benefit of such experiments should reach every child in our country through teachers in all schools and not just in workshops to a selective group of teachers. That was a mighty spark that ignited the making of “Simple tasks, Great concepts”. While framing a proposal to the NCSTC it occurred that in my long tenure as a teacher I had always seen several teachers have such brilliant ideas and hence I expanded this as a resource team trying to incorporate teachers about whom I was aware of. Our target of 100 experiments in Sciences was made more challenging when we were asked to confine largely to experiments in Life Sciences or Biological Sciences as they are often called as. Science without fun is futile. As teachers we should put in our best efforts to make life science teaching livelier, the title on which I wrote an article (Ismail, S.A., 1991. Life science teaching; why not make it livelier? School Science, 29: 20-23). 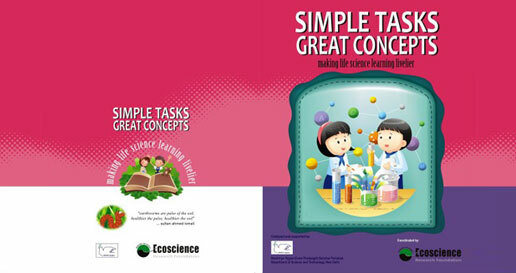 By reading “Simple tasks, Great concepts” which has been prepared in the most simple and presentable form; as a blend of science book and a coffee table book, this book my team is confident would attract not only teachers in India, but the NCSTC may have to send this to several countries around the globe. The style of the book has been so designed that it would be extremely simple for the teacher to design these experiments whichever class the child may be in; from Class 8 to Class 12, and moreover, in case the books are available to the children, then they themselves would be able to do most of these simple tasks in the book to learn the great concepts of science. As a biologist and an ecologist and one of the pioneers in earthworm research in India, life sciences have always been close to my heart. Always wanted to write this sort of a book for children and with a great resource team with me backed by the ever-encouraging Dr D K Pande, this book is to reach the schools to fill a great void that existed in science teaching. My resource team (informally in alphabetical order: Amina, Balan, Bhavanishankar, Chitra, Chitralekha, Dawood, Devasenapathy, Dharini, Kaleena, Karthika, Kulkarni, Lakshmi & Lakshmi, Nafisa, Pandeyji, Poonam, Radha, Soundar, Subbu, and Uma) generously poured in their time and knowledge in bringing up this book. In fact we might have also read, reviewed, viewed through several sources. There is no desperate attempt to elucidate from other sources as some of these experiments are basic and used by teachers around the globe. Any similarity to any experiment published elsewhere may be coincidental and not deliberate. As this book is being published for distribution by the NCSTC any such similarity may kindly be condoned. The charm and glory of the appearance of this book goes to Mansoor and his team of Graphiccare who has tried his best to bring it into a Science-Coffee table book… may be a first of its kind here. To Sabeeullah and Vijosh and their team, a bunch of youngsters this is their first attempt to convert the pictures of the book into action oriented life form in the CD. I am aware of the difficulties they have faced and thanks to them for whatever they have been able to complete which adds action to the CD. I sincerely appreciate and thank the Management and Principal of The New College, Chennai for allowing me to conduct preliminary meetings in the Department of Biotechnology. I should indeed thank Dr P Iyyamperumal, Executive Director of the Tamilnadu Science and Technology Centre and Vice Chairman of the Science City for providing all logistics for the brain storming workshop held in the premises of the Science City regarding this book and to Dr Devasenapathy of the Science City and his entire team for assistance. Thanks a lot to Chithra from ERF for the logistics. Keeping it to the last is to gratefully acknowledge the excellent cooperation and assistance extended to me by my family especially by my wife Tasneem and daughter Azra; the warm love and affection showered by my granddaughters Asma & Hafsa; and my extended family that’s by my 3 brilliant musketeers Imran-Jeyaprakash-Vincent, whose help and assistance is beyond mention. Though the urge to design experiments and the urge to write something related to this started in 1991, yet the real serious work on putting it on paper started during early 2009. Today as I look at the book the enormous amount of collective energy by my entire team reflects with zeal and I am confident that this “Simple tasks, Great concepts” would be put to great use by the schools in its real perspective. The writing of this book, not only made me glad and satisfying as I was fine tuning all the 100 experiments, but gave in me the extreme consolation that somewhere some child in some remote part of my mighty country would be able to do most of these experiments even without a laboratory. I am sure and confident my team also feels the same. To a large extent this book is structured to have experiments to be conducted from 001 to 100, but as a student of Life Sciences, who believes in Nature, just flip open whichever page you want and enjoy doing the experiment… and indeed learn in the process. Apart from the book and the CD, a set of 20 posters have been created by the participating schools. These posters have been whetted and beautified by the excellent artistic team of the Department of Fine Arts of the Stella Maris College, Chennai, for which I am personally indebted to the Principal Dr Sr Jasintha Quadras, the Head of the Department of Fine Arts, the faculty especially Dr Razia Tony and the great young budding artists Dhai Abinaya, Shruti and Sravanthi of that Department. Last but never the least; I thank God for having given my team and me an opportunity to create this compilation of experiments along with the CD and the posters for you… Come let’s “make life science learning livelier”. © Copyright Ecoscience Research Foundation. All rights reserved.